“Let’s have a talk.” Four small words that make both kids and parents want to run and hide. Let’s face it – talking to your parents about important issues like alcohol are not exactly on any kid’s list of fun activities. Kids think their parents grew up hundreds of years ago and couldn’t possibly understand what it is like to be a teenager today. Sure parents realize the importance of having “the talk” about alcohol, but procrastinate due to fear of awkwardness. Alcohol use among teenagers has become a serious issue and parents do not know how to approach their kids and speak to them in an effective way. On average, kids begin drinking at 13 to 15 years old (nahec.org). Parents remain the most important influence in the lives of their children, and talking about safe drinking behaviors is critical. We want to create a proactive approach to this serious behavior issue. 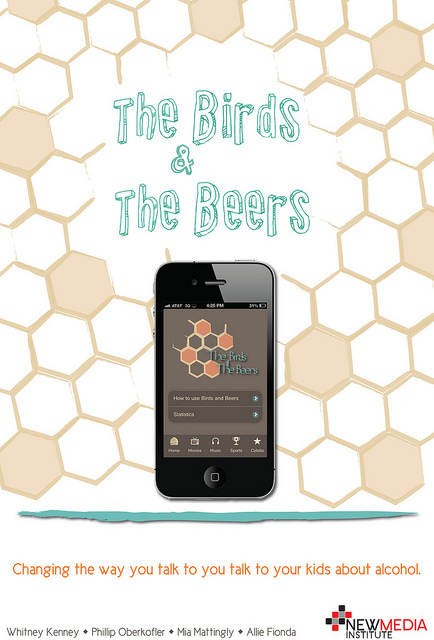 The Birds and the Beers aims to bridge the cultural gap between parents and their children. Parents will be able to access the Birds and the Beers’ mobile application to find pop culture news stories relevant to their child that will give them a conversation starter. The mobile application will include stories from the following topics: movies, music, sports, celebrities and local news. By using topics that are important to their kids, parents will be on the same level as their kids. Birds and the Beers hopes to give more parents confidence to start this important conversation with their children.